“Sorting your stuff” is a fun activity. It can lead so some personal revelations. What this activity involves is the participants emptying their handbags, book bags, backpacks, or other containers that they have with them. Then, they sort the objects into two or three categories and, in doing so, explain how they chose the categories into which they sorted the objects. This is an activity that I have used in conducting workshops on phenomenography. But, recently at the 32nd Annual Qualitative Analysis Conference (2015), I noted that some professors* of qualitative research methods also use this activity to introduce basic thematic coding. It is, however, possible to use this activity simply as an “introductions and welcome” activity in a more general sense. For classes that are not related to qualitative research, facilitators can ask students to select object of different topics and themes. Asynchronous: If used as an asynchronous activity, students can post pictures or videos of their objects. If using still pictures, it is helpful if the students take several pictures to show their thought processes. If using videos, the students can narrate their thought processes. Then, the class members can make suggestions and ask questions about the categories chosen. Synchronous: It is possible to do this activity in a synchronous manner, but it can be time consuming. It is possible in a synchronous format for the students to work together in groups. The students could aim their cameras at their tabletops and talk about what objects they have with them. Or, the students could come prepared to the online meeting with pictures of objects (perhaps even objects that are special to them; there could be a class theme). Then, they could arrange the objects on a shared whiteboard. Fellow classmates could even move the pictures around the whiteboard to discuss alternative classifications. As you can see, there are numerous ways to do this activity online. Students can also do some meta-coding where they locate themes and categories that are common across the entire class. Whether face-to-face, asynchronous (text-based), or synchronous (VOIP), ask the students to have their handbags, backpacks, book bags, etc. near their computers (or bring to class). The instructor may or may not wish to have the students read related course materials or watch videos about qualitative research (if that is the objective of the class) in advance. Test the whiteboard and/or discussion forum to ensure that students can post images and/or manipulate the system in ways amenable to the activity. For example, students must have adequate permissions to manipulate the whiteboard. And, they must be able to post images to the discussion forum. Depending on the format (face-to-face, asynchronous, or synchronous), the instructor needs to think about how to initiate the activity during the session, and to facilitate turn-taking and group structures (particularly for synchronous activities). At the beginning of the session, the instructor can demonstrate his/her own special objects and how s/he would categorize them. During the activity, the instructor can help guide the discussion of the categories and the processes. And, it is important to debrief the students at the end. Help the students understand thematic coding, for example. And, if relevant, help the student make connections to the literature as well as any assignments or projects for the course. I have had excellent success in using this activity for facilitating phenomenography workshops. However, it is important to remind students of qualitative research that they will more than likely be categorizing complex concepts. The use of simple manipulatives has its limitations. Therefore, I recommend this type of activity as a springboard. More in-depth discussions and activities are necessary in any instruction of qualitative thematic coding. By asking the students to reach into their own handbags and backpacks, you are asking them to share some information about themselves. What we carry with us daily can provide insights into who we are as people. This activity can stimulate interesting and, at times, interesting discussions about what is important to us. I use “us” because the instructor should actively demonstrate and share alongside the students. In this way, this activity very much contributes to the acceleration of identities. *Note: The speakers at the 32nd Annual Qualitative Analysis Conference who mentioned this technique were: Gail Lindsay (UOIT) and Jasna Schwind (Ryerson University). This activity is a based on the old Canadian TV series “Front Page Challenge”. According to the Museum of Broadcast Communications, this quiz show “featured four panelists, usually well-known journalists, who would ask yes-or-no questions in an attempt to correctly identify a mystery challenger connected to a front-page news item, as well as the news item itself. After the panelist had guessed correctly—or been stumped—they would proceed to interview the challenger”. Naturally, this activity is ideal for social studies or political science classes. However, this idea can be used in nearly any class. In my case, for example, I would consider selecting someone who is an expert in instructional design or and educational learning theory. Asynchronous: This would constitute a week-long asynchronous discussion forum activity with a willing expert and a moderator. In an asynchronous discussion forum, it is best to introduce the activity in the forum description (or the first thread). Synchronous: Mystery topic/guest would make an excellent hour-long discussion using Collaborate, Adobe Connect or other similar tools. The instructions can be sent to the students prior to the synchronous session along with the invitation link. Invite the mystery guest well in advance. Experts often have limited time. Prepare some “interview questions” (or discussion prompts) in advance and discuss them with the guest. It is possible that the students will not be fully prepared to ask effective questions on a new topic. Make sure the guest understands that s/he can only say “yes” or “no”. (This is similar to the rules in Twenty Questions (Accelerator #1)). Instruct the mystery guest to log in under the pseudonym “mystery guest”. They must use the guest access to the synchronous or asynchronous environment. During this activity, the students in the class can work together as a team. Alternatively, the class could be split into groups and compete to identify the guest. The facilitator can ask the first question to get the activity started. The facilitator can also nudge the first few questioners to change their questions to yes-or-no format. The facilitator can help the students understand how to start generally and narrow the questions as they go. After the students guess the identity of the mystery guest, the facilitator can open the floor to allow the students to ask more specific questions to the guest. How is DBR different from or similar to action research and other methodologies? A diagram showing the iterative nature of DBR. A description of a successful DBR project. I would provide a rating of this activity, but I have yet to try it. Note: for an introduction to identity accelerators for online teaching and learning visit this previous entry. Guess The Untruth is an activity that I adopted years ago when teaching English as a Second Language at the University of Lethbridge. Originally, it was a way to encourage students to practice the present perfect tense. This activity can be very interesting and engaging. It offers the students an opportunity to share their cleverness, their sense of humour, and some interesting aspects of their lives. In other words, the students can start sharing and shaping their identities. Asynchronous (recommended): warm up activity. Makes use of biography tool (LMS, blog, etc.) and text-based discussion forums with moderation. I employ this activity almost exclusively in asynchronous environments. Synchronous (possible): warm up in VOIP (Skype, Blackboard Collaborate, Adobe Connect, etc.). But, this activity works best when the students can draw upon some information from profiles updated in the LMS (or other tool) biography pages. Biography tool: most LMSs and social networking systems offer a means for the students to write a personal profile. Discussion board: set up a discussion forum specifically for this activity. For me, it is usually the “welcome” forum. The teacher (or facilitator) asks the students to update their profile/biography pages within LMS (or other system being used. The teacher then asks the students to go into the discussion forum and start a thread with two true statements about themselves and one untrue statement. The teacher prompts the students to read each other’s profiles. Then, the teacher prompts the students to read each thread in the discussion forum and guess which statement is untrue. Set a time limit (a week) for the students to guess each other’s false statement. Then, ask the students to confess. Starting a discussion thread with the three statements about him/herself. Guessing about one or two of the students’ statements and demonstrating the logic processes by comparing what is said in the profile and how the three statements might be truthful or not. Fessing up! This, too, is part of leading the group: ending the activity and debriefing. Wthin a day of starting the activity, there can be 100 or more discussion messages posted for a class of 20 students. It can be a high volume activity, so be prepared. I have been marooned on the Orinoco River. I like catsup on my waffles. I have practiced Judo in Spain. Which do you think is the false statement? In this article, the authors discuss a similar activity called “Liar, Liar”. Twenty Questions is an old game that many of us played as children. But, we can also use it as a “serious game”. I would recommend that it be used as a warmer later into the semester after the students have already introduced themselves and engaged in some interaction. If used as a collaborative activity, the students can discuss strategy. Online collaborative activities help the students get to know each other better. Synchronous: warm up or extended activity in VOIP (Skype, Blackboard Collaborate, Adobe Connect, etc.) or Twitter. Asynchronous: text based activity for discussion forums with consistent/regular moderation. The moderator will have to establish timelines for interactions, so the activity remains alive over a set period of time. One issue with using this accelerator asynchronously is that a very engaged student (or group of students) might arrive at the correct response before others have joined in. Decide if you want this to be a collaborative activity or a competitive activity. If you goal is collaboration, let the students work together. If it is competitive, divide them into groups. Set up a “breakout room” for the class or the groups (if using a synchronous modality). Ask the group (or one of the groups) to start. I used this activity last night during a synchronous discussion with some graduate students studying program evaluation. Since I didn’t want to take too much time, I used one concept to get the class warmed up. I chose a concept that allowed the session to focus on a fundamental idea that branched into the current assignment. The concept was “program”. The exercise allowed us to discuss the definition and characteristics of a “program” as per program evaluation parlance. The discussion for the subsequent hour centered on program evaluation planning: focusing the evaluation, determining stakeholders, questions formulation, and selecting appropriate models. For the current assignment, it is essential for the students to wisely select a program of clear scope and boundaries in order to succeed in the development of a program evaluation plan. (It is a 6-week course! They need to choose something do-able.) Anyways, I recommend that you choose the concept(s) strategically: something relevant and important to the subsequent discussion. The students appeared highly engaged. As higher education embraces educational technologies to greater extents, it is not uncommon for faculty to find themselves suddenly facilitating online classes. They might be asked to lead online discussions through synchronous tools such as Adobe Connect, Blackboard Collaborate, and Big Blue Button to name a few of the tools available. Asynchronous, text-based discussions remain common likely due to temporal and spatial flexibility. Those new to online facilitation might feel that the online environment is one of disembodiment offering few contextual or physical cues that instructors traditionally rely upon in face-to-face classrooms in order to determine comprehension, prior knowledge, and attentiveness. Some instructors might feel a sense of isolation because they cannot see and, therefore, feel they cannot get to know their students well enough to anticipate their needs. Some scholars suggest that online learning offers a more egalitarian environment where learners can interact unimpeded by issues of race, nationality, gender, and social status; others suggest that the online environment is simply another modality. I take the position that online modalities offer an array of social cues. Walther (1996) proposes that participants in mediated environments form impressions of one another much as they would in face-to-face environments, but that it takes longer to generate and collect observations. He argued that online interaction can even become hyperpersonal?leading to greater intimacy as individuals employ additional techniques to plan, contemplate, edit, and project identities of self and others (Chayko, 2008, Henderson & Gilding, 2004; Merchant, 2006, Walther, 1996). Furthermore, anticipation of future interaction has been found in some longitudinal studies to prompt “communicators to seek more information about one another, to act more friendly, and to cooperate in negotiations” (Walther, 1996, p. 12). Beyond the notion of the hyperpersonal, we might also see students actively shaping their identities based on what they would like to project. Walther et. al. (2006) propose that, in the absence of visual cues in online interactions, people will actively select aspects to present, taking more time to compose their messages. In return, those who receive these messages will develop “idealized attributions of their online partners” (p. 637). And, humans are never disembodied. In any given online class, students and facilitators are tapping on keyboards, speaking into microphones, snapping pictures, and sharing videos. They are using their fingers, voices, ears, eyes and minds to manipulate the technologies that surround them. They are situated within physical contexts; they have been socialized in physical contexts. And, they bring their situatedness, their prior knowledge, with them into their online interactions. As online facilitators, we need to harness the tools at our disposal in order to get to know our students. We need to learn how to read online cues. Our students also need opportunities to share their prior knowledge and express who they are outside of andin relation to their instructors and fellow online classmates. To this end, I am going to start sharing and collecting what I am calling “identity accelerators”. These are activities that can be used in a variety of online contexts. I would like to invite anyone out there in the world to share ideas on how to increase engagement and identity development in online teaching and learning environments. And, I am always looking for ideas and collaborators. Chayko, M. (2008). Portable communities: The dynamics of online and mobile connectedness. Albany: State University of New York Press. Henderson, S., & Gilding, M. (2004). “I”ve never clicked this much with anyone in my life’: Trust, and hyperpersonal communication in online friendship. New Media & Society, 6(4), 487–506. Walther, J. B. (1996). Computer-mediated communication: Impersonal, interpersonal, and hyperpersonal interaction. Communication Research, 32(1), 3–43. For a full description of each category, visit Richard Byrne’s page: Free Technology for Teachers. 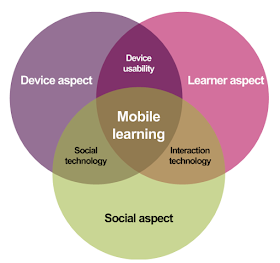 This list is being developed as I sit and listen to workshops and presentations at the Mobile Learning Week at UNESCO Headquarters in Paris (February 17 to 21). Before using any of these tools, check the legal agreements. In some cases, you might forfeit ownership over your creative work. Nonetheless, these are some useful tools. For the most part they are free except where indicated. If you know of any additional tools, let me know . . . leave a comment. If you’ve done some on an iPad or desktop computer, add music, add text, save. Then, you can link, embed, etc. Really nice, but costs approximately $25/mo. Provides an interesting online interactive tool. Looks like an excellent way to create a video/animated lesson with voice, writing, drawing, etc. Other than the “My Quizzes”, it appears that it is a tool that is used in a face-to-face classroom where learners are asked a question, and they input their answers into their mobile device/computer.